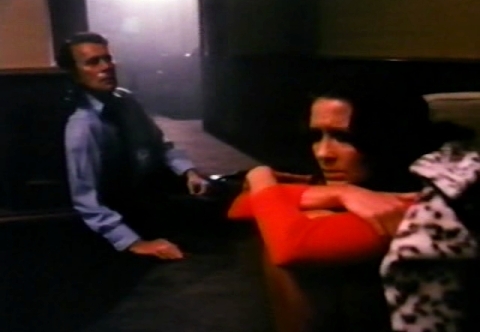 Terror on the 40th Floor is usually said to be a rip-off of The Towering Inferno. I’m sure it is, though according to the IMDb, Terror was actually released a few months before Inferno. Maybe the producers of Terror read about Inferno in the trades and decided to beat Irwin Allen in the race to the screen (though this one was made for the smaller screen). Who knows? And, more to the point, who cares? Directed by Jerry Jameson, the man behind several other disaster flicks (Airport ’77 among others), Terror on the 40th Floor is a very lackluster affair. Starring a bunch of lesser names, it is the story of a corporate Christmas party that turns into a nightmare. We’re never told the name of the company, or even what business they’re in, but three of the executives decide to keep on partying with some of the secretaries after the rest of the staff have left. Meanwhile, a drunk janitor accidentally starts a fire down on the 12th floor. The fire starts spreading upwards through the building, and after a while the revellers up on 40th discover the smoke. They head for the elevators at the very same time that the fire department cuts the electricity to the building. The doors to the stairs have been locked by the security guard, and the windows are unbreakable, so the group is trapped. If this short summary leads you to believe that this movie might be full of action, it really isn’t. While the above is the basic setup, most of the time is spent on lifeless romantic advances and the various regrets and disappointments of the main characters: loveless marriages, dead sons, unwanted pregnancies and failed careers. At random points in the movie, flashbacks are inserted to help us understand the inner turmoil of some of these people. Not that it works all that well. At 96 minutes, Terror is a slow-moving, murky film that never comes to life. You watch this group of people bicker, cough and sink into despair, which mostly serves to make you feel somewhat depressed yourself. Not even the fire sequences are much to celebrate, and there’s only one fatality (one guy falling down an elevator shaft). Feel free to pass on this one.